When your son cut off your head, did you grow the head of a cow in its place? Well, maybe you don't have that in common with Isis, not many of us do…but you could have more in common with the Egyptian Zodiac Sign Isis than you think. Characteristics of the Egyptian Zodiac Sign Isis: If your sign is Isis, you have a straightforward, shoot from the hip way of speaking. You are full of energy and need a lot of variety and stimulus in your life. You are confident and love life. You don't like it when things become too serious, and you might want to run away. Use your logic and intuition to look at things from a new perspective, or fall back on your excellent sense of humor to make it through such times. You look after those around you, but will dole out discipline when needed. You see the best in others, but remember to keep your standards high. Don't get too disappointed when things don't go your way. 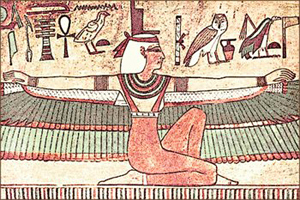 About the Goddess Isis: The Greeks gave Isis the name we know her as today. To the Ancient Egyptians, she was Auset or Aset. Isis represented the ideal mother and wife. She was the patron goddess of nature and magic. She protected the dead, slaves, children, the poor, and sinners. The name Isis means throne and she is often shown wearing a throne on her head. The pharaoh was viewed as her child, and he sat on the throne she provided. Isis was the wife and brother of Osiris, and the mother of Horus. When Set murdered Osiris, Isis helped resurrect him. She gathered Osiris' body parts from around the earth and restored life to his body. This death and resurrection was deeply ingrained in Ancient Egyptian culture. They believed the Nile flooded everywhere from the tears that Isis cried for Osiris.